Weighty Matters: I Say Something Nice about KFC! 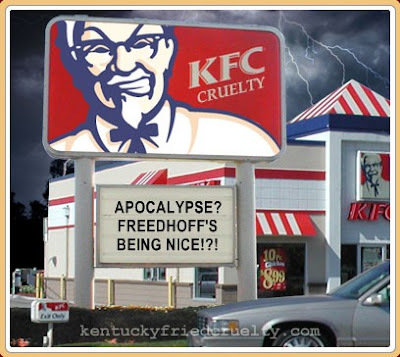 Perhaps in his old age the Colonel's getting soft, or maybe he's just seeing the writing on the wall? Yesterday YUM Brands, KFC's parent company, announced that their restaurants (which also include Taco Bell, Pizza Hut, Long John Silver's and A&W) will be voluntarily placing calorie counts on menus at ALL American locations! This announcement came a day after the State of California passed legislation requiring all chain restaurants (more than 20 locations statewide) to do the same. Great job Colonel, and frankly smart as given that eventually it's going to be a federal law so why not score some good press by doing it now voluntarily? Hey Colonel, why not Canadian locations?